An undercover drug investigation in East Boston that kicked off an international money laundering sting has led to the seizure of millions of dollars in heroin, cocaine, and drug money, and charges against 20 suspected associates of Colombia’s largest drug cartel, state and federal officials announced yesterday. The multiagency and multinational investigation, spanning four years, was based on the work of an undercover Massachusetts State Police trooper in Boston who posed as a member of the drug trafficking ring, wiring money to cartel members through bank accounts around the world. The 20 people arrested yesterday, who were captured in Massachusetts and Colombia, are all slated to be tried in Boston on charges of laundering drug money through the region, US Attorney Carmen M. Ortiz said. The DEA’s effort to “follow the money’’ from the initial pick-up, led agents through a tangled network of US businesses, Colombian exchange houses, the Black Market Peso Exchange, and bank accounts in multiple countries. Officials estimated that as part of Operation Fire and Ice, they seized about $200 million in cash, more than 1,100 kilograms of cocaine and 46 kilograms of heroin around the world. “If we can hit them in the pocket, where it hurts, we can make a significant dent,’’ Ortiz said. Included in the arrests were three suspects with ties to Boston: Julissa Perez, 34, of Malden; Henderson Martinez, 22, also known as “Juan,’’ of Boston; and Roberto Torres-Colon, also known as “Chappa,’’ believed to be from Lawrence. An unnamed fourth suspect from Jamaica Plain is still at large, as are five suspects in Venezuela. On June 1, 48 bank accounts controlled by the suspects were seized by agents in Los Angeles, Miami and New York. These accounts were identified after the DEA wire-transferred tens of millions of dollars into numerous US bank accounts, all of which were subpoenaed and analyzed for connections to the drug cartels. The investigation involved multiple US agencies, including the DEA, the Massachusetts State Police, and the Internal Revenue Service, as well as Italian and Colombian officials who helped track down suspected associates of the notorious Medellin drug cartel La Oficina de Evigado in Colombia. At an afternoon press conference, Ortiz was joined by Giancarlo Capaldo, Italy’s chief anti-Mafia prosecutor; Brigadier General Cesar Augusto Pinzon Arana, the commander of an elite antidrug unit in Colombia; and Detective Vittorio Rizzi, commander of a special investigation unit for the Italian National Police in Rome. The operation began in 2007, when an undercover money laundering investigation in Massachusetts led to the infiltration of a network of money launderers and brokers based in Venezuela and Colombia, an affidavit released yesterday said. The DEA set up undercover bank accounts in New York and Massachusetts, which undercover agents used to receive and wire money. 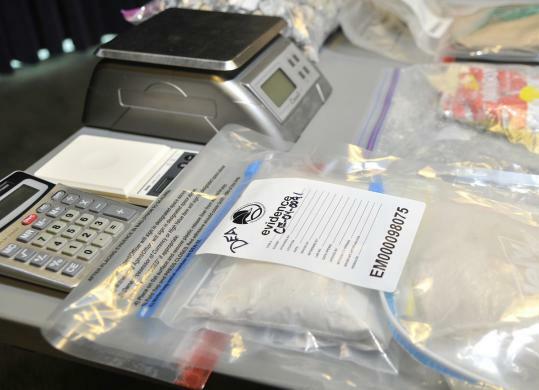 Over the next four years, the undercover agent made at least 59 drug money pick-ups in major US cities, multiple countries and a handful of areas in Massachusetts, including Boston, Woburn, Revere, and Somerville. Some of the accounts were opened in the names of exchange houses, which are private Colombian financial institutions that provide brokerage and investment services, Ortiz said. Others accounts were tied to Venezuelan, Colombian, and Florida businesses. Ties to Florida ran deep in the investigation: In 2009, agents executed 60 warrants in Miami and seized more than $151 million from Bank of America accounts controlled by Rama K. Vyasulu, a Florida man who pled guilty to charges of money laundering. Ortiz said the investigation of American banking institutions and accounts is ongoing, and declined to comment further. Other key players were “money brokers’’ in South America, who arrange for couriers to deliver dollars from US drug sales to money launderers who pass the money through US bank accounts. Then, traders on the Black Market Peso Exchange, a non-regulated currency exchange, convert the money using a dollar-peso exchange rate that is lower than the formal market rate. Some of the money seized will go to Colombian and Italian governments, Addington said. Some of the US cut will go toward the federal deficit, and some will stay with the DEA.